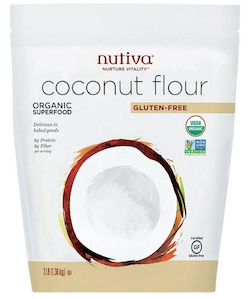 Nutiva Coconut Flour Unrefined 3 lbs. This versatile flour is finely ground from dried coconut meat, with a lower glycemic index than most traditional flours. Its rich texture and natural sweetness make it great for baking. Coconut flour can be substituted for up to 1/3rd of wheat flour in standard recipes. Due to its high fiber content it absorbs lots of liquid, so increase the liquid in the recipe by an equal amount.